Water-soluble oil for wooden surfaces in exteriors. Protects from moisture and dirt. 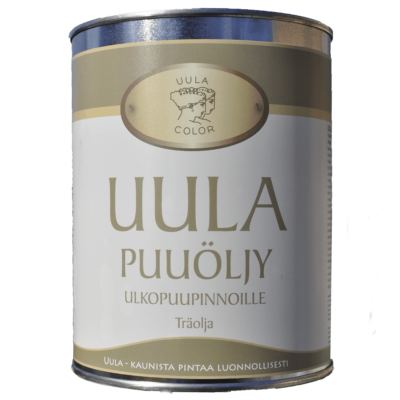 Traditional Wood Oil made from Finnish Linseed Oil. Our delicious Interior Color Chart is full of beautiful colors and by combining them you can find the right feeling just for your home. Beautiful, neutral tones are suitable for small and large surfaces, walls and floors, and of course furniture. Get to know them. Love them. Be inspired. Let the colors take over. Get carried away with the stories and atmosphere created by The Treasures of Colors brochure. Choose your favorite color and let your ideas fly. Be inspired by our nature and its changing colors. The secret in our Traditional Color Chart is the timelessness of the colors and their compatibility. Be enchanted by our colors which are made of genuine pigments. Choose your favorite tones to suit your homes exterior wood surfaces, walls and railings, wooden floors, doors and window frames. Let your mind flow. Design and execute. Finding the right paint is easy! From our wide range of products, you can find the right paint or preservative for your homes interior and exterior surfaces as well as quality equipment to help you with the painting. Get to know the selection in our webstore. Our paint calculator helps you estimate the amount of paint needed. Insert the material of the surface and the area of the surface that is to be painted and the calculator will show you the right amount of paint in litres. You can collect the products ordered from our webstore from the closest retailer or we can deliver the products to your closest pickup point or straight to your home. Do you require painting assistance? We offer you many decades worth of experience to aid you with the different phases of your painting. Our blog and gallery makes it easy to choose the right colours with the help of various colour palettes and pictures. To ensure the right colour we recommend you order a colour chart from our webstore or order a sample paint of the desired colour. Our webstore will recommend the best painting equipment’s for the chosen paint to ensure the best outcome. Before you begin painting we suggest you familiarize yourself with our comprehensive painting guide, which can be downloaded to your computer. If you prefer to use a professional painter you can find painters, whom we can highly recommend, on our website.